Fire tornadoes, or “fire whirls” a.k.a. “fire devils,” are one of nature’s rarest and most awe-inspiring creations. These unique combinations of fire and wind have amazing destructive potential. Indeed, the most deadly fire in U.S. history was caused by a fire tornado that tore through a helpless community. More commonly known as fire whirls or fire devils, fire tornadoes aren’t exactly tornadoes in the truest sense. These fiery twisters don’t simply appear out thin air as they require a unique combination of meteorological conditions and a nearby wildfire. Much of the detail surrounding fire whirls’ remains unknown to experts. For example, nobody is quite sure why they have the tendency to reach increasingly higher elevations and burn rates as they twist onward. 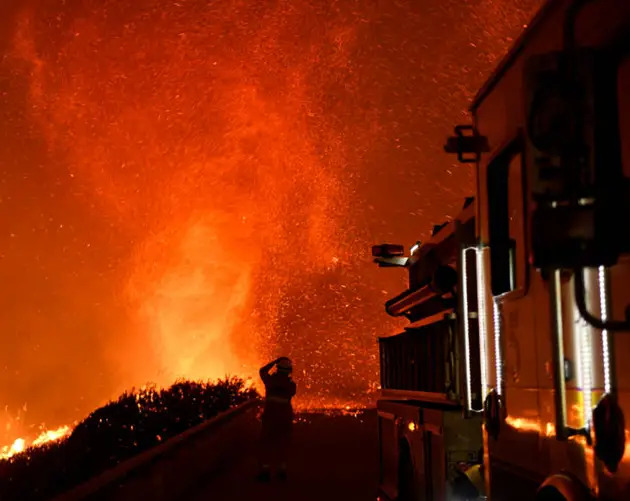 The Carr Fire situation became especially hairy when the fire tornado reached Redding, a city of 90,000 people, with winds “in excess of 143 mph” as reported by the National Weather Service. The whirl was so strong that its ranking on the Enhanced Fujita (EF), a scale that measures the intensity of tornadoes, reached class three — out of five. “You’re starting with a rare event to begin with, and for it to actually impact a populated area makes it even rarer,” said Neil Lareau of the University of Nevada. After marveling at these photos of terrifying fire tornadoes, take a look at the mesmerizing blue fire of the Kawah Ijen Volcano. Then, learn about Greek Fire — one of history’s best-kept military secrets.